At first look, Nate Wright doesn't look like destiny's child. He's not dumb, but he is a devoted slacker in class, totally out of the running in any competition with his perfect big sister, Ellen, or his brainiac buddy Francis. He's not a talented charmer, like Artur, whose earnest broken English has the girls, especially Nate's secret love Jenny, falling all over him and the teachers wrapped around his artistic pinky. Nope, Nate's special talent is his ability, defying all external evidence, to believe that he is destined for great things. So when friend Teddy gives him a fortune cookie which prophesies TODAY YOU WILL SURPASS ALL OTHERS, he just knows that today is the day he will achieve greatness before his awe-stricken classmates. But when attempts to slip his artwork into the hall display case on top of Artur's and an abortive love poem to Jenny in creative writing class go awry, Nate finds himself with two pink detention slips long before lunch! The rest of the day goes downhill from there, until at the final bell, Nate finds himself with a pile of pink slips, standing once more before the desk of Mrs. Czerwicki, dragon of the detention room. "Nate," she asks, "just how many teachers wrote you up?" "All of 'em," I say.... "And the principal." Mrs. Czerwicki looks a little stunned. She spreads out the slips on her desk like she's playing solitaire. She shakes her head. "Nate... "You appear to have established a new record." "Over the years, several students have received four detentions in a single day. A few have had five. One even got six. Until now...."
Wait. "Does that mean I've... SURPASSED ALL OTHERS? Mrs. Czerwicki grimaces. "Well... I suppose you could put it that way." 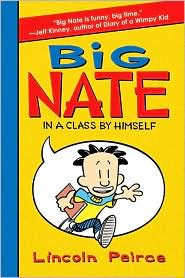 The legions of fans who wait eagerly for the next book in the Diary of a Wimpy Kid series will find veteran cartoonist Lincoln Peirce's first venture into the book format for his famous comic hero, Big Nate: In a Class by Himself (Harper, 2010) just the sort of source of solid laughs which will find a place in their backpacks, along with a bag of Nate's favorite junk food, Cheez Doodles, as provender for surviving those perilous middle school years.